OK so, not sure that if this issue has been addressed or not, but the N7 has difficulty holding onto a WiFi signal. I own a N4 and a N7, and while I get a good signal, around 3 bars of wifi on my N4, standing in the same area with my N7 will barely be able to hold one bar, and often drops WiFi completely. This isn't anything new either. This has been here since day one. Is there anyone else with this issue? Is there a way to boost the dang WiFi? Half the time when I am at work I have to use my N4 because the N7 cannot hold the WiFi. Thanks. 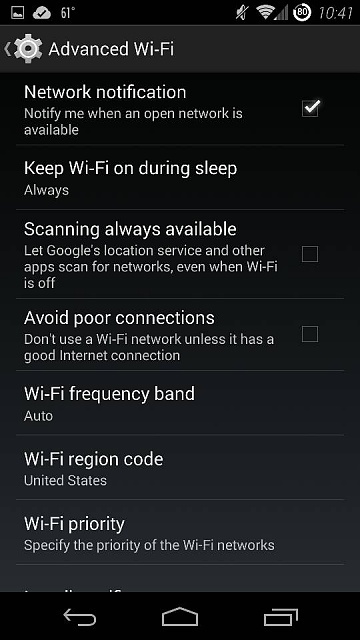 In the advanced settings of Wifi, do you have avoid poor connections checked? Well no, but when I'm at work, there is only one WiFi to choose from. Either you connect to it or you don't. I don't see an avoid poor connections option in the advanced options. Keep in mind your N4 and N7 are completely different devices. With antennas placed in different parts. So comparing the two is not a very good comparison. To see if your N7 has bad wifi it would be a lot more beneficial to get another N7 in there to compare side by side. Yes, I know and realize that devices are different in terms of how well it receives WiFi signal, I just thought it would be fairly similar. But your right, a N7 side-by-side w/ another N7 would be the only way to confirm if something is wrong with my N7. Is this where you were looking? I own a N4 and a N7, and while I get a good signal, around 3 bars of wifi on my N4, standing in the same area with my N7 will barely be able to hold one bar, and often drops WiFi completely. Sounds to me like your N7 is defective. It's an old thread but perhaps your antenna connection needs to be reseated. It has helped others. You could try pressing the back cover and see it bars increase. Hey, good read, thank you! WiFi turns on automatically, how do i stop this? Interesting WiFi Problem, Suggestions Please?